Murray has been interviewed on the Ideal House for Home Style Green, run by Matthew Cutler-Welsh. Well we’ve seen in a New Year, and one which our dream will be realised. After a quiet few weeks over Christmas where the construction industry heads to the beach, we’re back and in full swing. 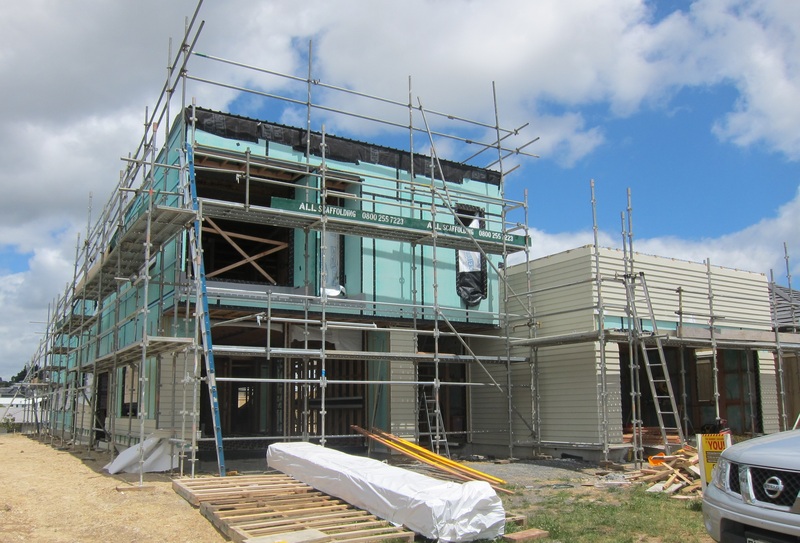 The home has had most of its James Hardie Scyon Linea Weatherboards installed over the green RAB (rigid air barrier) board, and the James Hardie Scyon Stria cladding (vertical) is now on-site. The neighbourhood has been talking about the “big green house” as it’s stood there over Christmas with it’s first line of weather defence on display. The powder-coated aluminium flashings that surround the PVC windows from Warm Windows should be on site any-day, and once they are installed the rest of the cladding can go up. The windows themselves are due to arrive from Europe on Sunday, and then they need to be delivered from the wharf to Warm Windows, where they will have their timber liners installed before being delivered to site and installed. We are hoping to have the home “closed in” in the next 2-3 weeks, which will then allow a wide-range of tradesmen on-site. 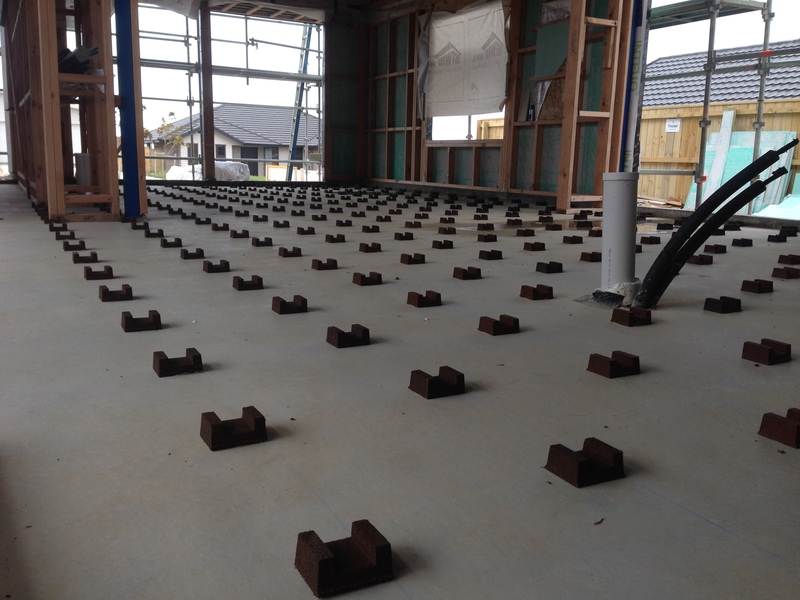 The Viking Skellerup waterproofing has now been installed by the team at Rok Build over the garage-deck, as well as the front of the master bedroom. 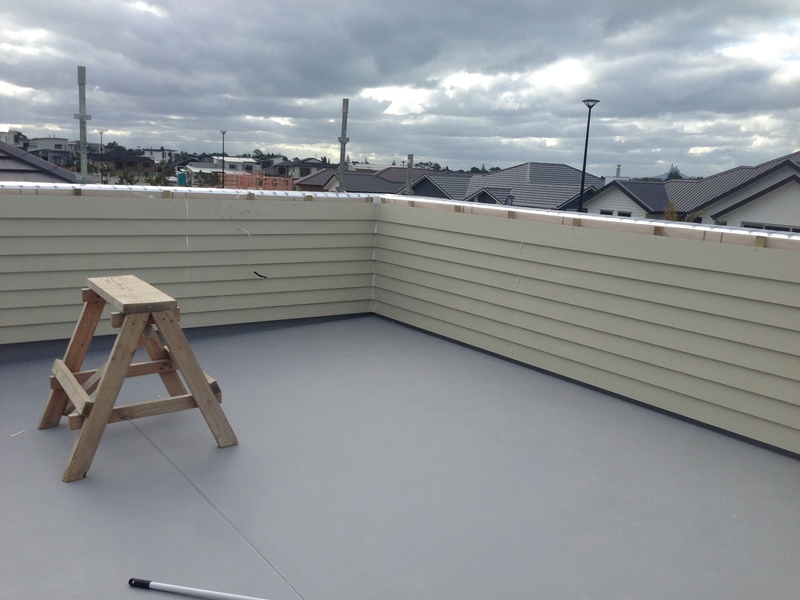 The deck looks amazing, and we’ll be installing a floating tile system with 600mm structural tiles to level this area out. All the sill-tapes from pro clima have been installed around the window openings, ready for the windows to be installed. The ExtoSeal sill-tapes (new to the market) are so incredibly sticky and flexible – they were installed right over beaded water and stuck like nothing you’ve ever seen before. We’ve also been using the Tescon Extora to seal the rigid air barrier. The Earthwool (r) glasswool insulation (currently piled up in our rental), plaster board and stopping will be completed by Apex Ceilings once we’re water-tight. Efficient Air have been out on site measuring out the ducting for the Zhender ventilation system, supplied by FanTech, and All Go Plumbing have put in all the external plumbing where it protrudes through the cladding. We’ve taken delivery of the Grohe outdoor shower from Paterson, and can’t wait to get it installed! 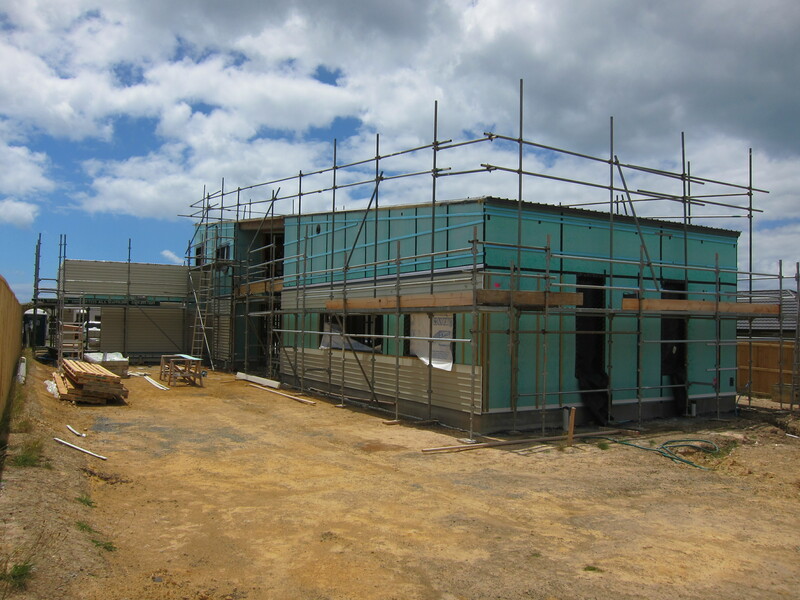 Our electrical installers, TradePartners & AWS have also installed all the wiring for external lights and power-points, and will be back soon to run the cabling for the solar PV System. The 8kW Power Technology system is due to be installed next month. The builders are still thrashing their waterproof/tearproof Tough Plans from ReproOnline, and the comment today from the site manager was, “You must be glad you’ve got those plans, otherwise you would have been through ten sets by now.” The cradles for the internal flooring system from Batten and Cradle are starting to be laid, and all the battens are now on-site waiting for it to be closed in. Image below. We are also extremely luck to have Incredible Eadibles join our project, and they will be supplying a wide range of food-producing plants and trees for our organic gardens. We’ve been drooling at their amazing variety and can’t wait to move onto the landscaping stage of the build. Thanks to the team at Palladium Homes for where we’ve got to so far, and looking forward to celebrating the completion hopefully in April, early May. We’re sitting around 10% over-budget at the moment and are working hard to ensure we don’t go any more over. We’ll be providing a full breakdown of costs by stage later in the build.